the APAHS/StoryCorps APA Family Recording Day. Would you like to record your 9/11 Reflections, in order to document Indian-American perspectives? What are your thoughts about the event (or anything following the event) and how it impacted you as an Indian-American? A few appointments are available for recording this topic and other topics of your choice at the APAHS/Storycorps Recording Day on the second Saturday of every month at the Atlanta History Center. Please contact Tricia Sung, executive director, Asian Pacific American Historical Society (APAHS) at apahsinfo@gmail.com for an appointment. Each month, on the 2nd Saturday of the month, the Asian Pacific American Historical Society (APAHS) partners with StoryCorps Atlanta to bring Asian Pacific Americans with diverse backgrounds and life experiences to the StoryBooth at the Atlanta History Center for "APA Family Recording Day" so that they can share stories about their families, interests, and reflect on Asian Pacific American lives in the South. Multilingual and multigenerational recordings are particularly encouraged! Recordings along with a photo of the recording participants are then archived with StoryCorps, the U.S. Library of Congress, and the Asian Pacific American Historical Society. 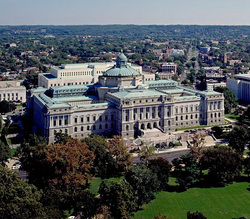 AFTER YOUR RECORDING if you are in Washington, D.C., visit the U.S. Library of Congress, American Folklife Center in the Thomas Jefferson Building (photo at left) to listen to your recording! And visit the Asian Pacific American Center, and especially "Beyond Bollywood: Indian Americans Shape the Nation," a groundbreaking exhibition at the National Museum of Natural History (NMNH).